Character cottage with garden between Bayeux and Port en Bessin. Lovely accommodation in a lovely location. we were welcomed and set up in the cottage by the owner and to his credit that's the last we saw of him leaving us to enjoy our stay. Perfect spot for visiting the beaches during the d-day week. Only downside is that we had to use the fold up bed and then there were no comfy chairs to sit on, only a small thing really. Would stay there again without doubt. Very nice and quiet. Much roomier than the pictures. A great getaway from the busy city with all of Normandy an easy drive. Great host and hospitality. One small improvement would be a visible sign or location marker. You can't see the cottage from the road and GPS does not always work accurately. Once we found the cottage it was perfect. Thank you Mike. It was a pleasure to welcome you. What a beautiful rustic cottage this is and very well equipped. Lovely peaceful surroundings and very well located for all Normandy has to offer. Cyril is a wonderful host very warm, welcoming and very helpful nothing is too much trouble. Cyril lives next door which is completely private and separate from the rental cottage which is fantastic if you require anything. We only had a three day stay here but would love to come back and stay at this lovely little cottage for longer. If you are looking for a place to stay for a family of 4 that is in close proximity to all of the Normandy beaches and museums, then this is the place. The cottage as a bedroom with a double bed and a futon that can easily sleep 2 kids. the cottage is quite spacious and has all of the amenities you will need (including a nice garden for relaxing after visiting all the attractions). Our host was very nice. The closest grocery store is 8 minutes away. Juno beach took us 20 minutes drive and Omaha beach was about 15 minutes. We also went to Gold beach and viewed museums in Arromanches, Juno and the American Cemetery at Omaha. Our house is yours now. Come back when you want. We (2 adults and 2 kids) stayed at this apartment for 3 nights in July. It was very quiet, comfortable, and beautiful. Cyril was very welcoming and thoughtful. We had a wonderful time. We would stay there again in the future, and we would recommend it to anybody! Thank you, Cyril! It will be nice to see you and your family again. We certainly enjoyed our stay in this spacious and homey cottage which is located outside Bayeux and within a short drive of most World War II historic sites. The cottage features a large living room-dining room-kitchen and a separate bedroom. Cyril Demoulin, the owner, is a great guy. He went out of his way to accommodate us and lent us a great local map which proved invaluable. 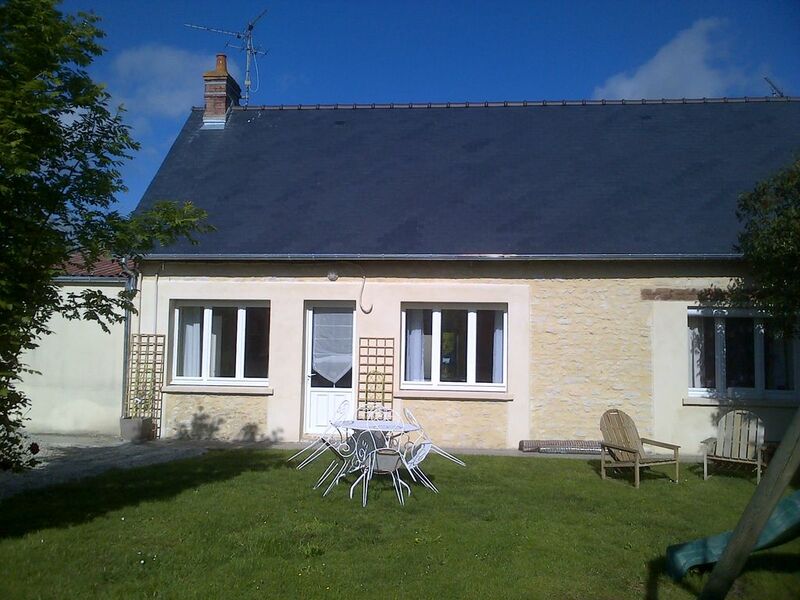 Located in the heart of Bessin 3 km from the sea and 10 km from Bayeux and the landing beaches.